For some added traditional style in your bathroom, choose this beautiful vanity. With a white quartz counter and white solid wood base, this piece is very stylish. With drawers and double-door cabinet, this vanity set is also great to keep items in. Add a classic feel to your bathroom with this simple vanity set from Simpli Home. Winston 49-inch W 2-Drawer 2-Door Freestanding Vanity in White With Quartz Top in White For some added traditional style in your bathroom, choose this beautiful vanity. With a white quartz counter and white solid wood base, this piece is very stylish. With drawers and double-door cabinet, this vanity set is also great to keep items in. Add a classic feel to your bathroom with this simple vanity set from Simpli Home. 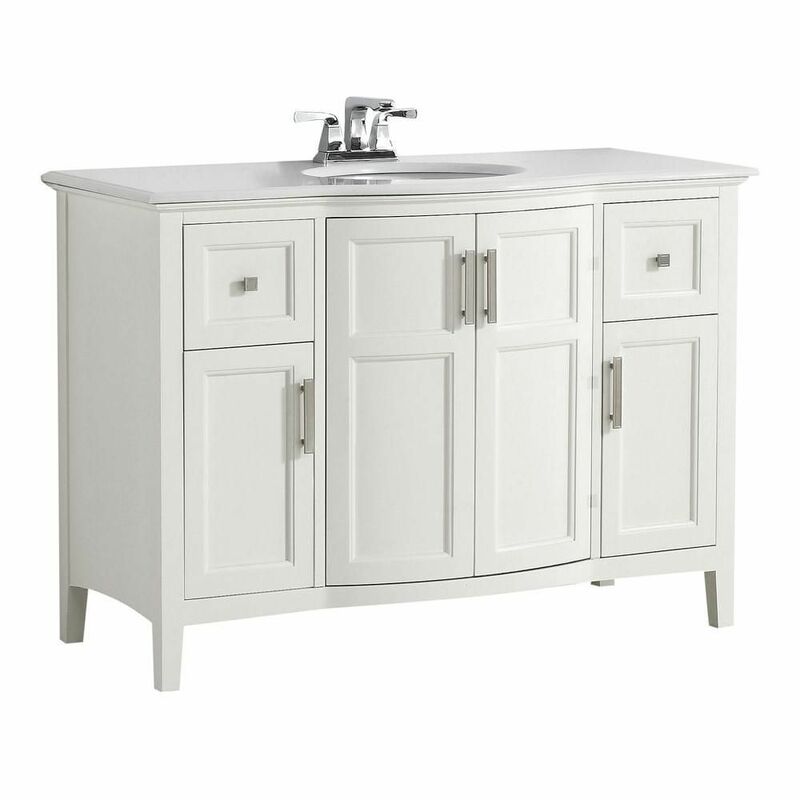 Winston 49-inch W 2-Drawer 2-Door Freestanding Vanity in White With Quartz Top in White is rated 4.8 out of 5 by 4. Rated 5 out of 5 by Victoria from Beautiful vanities. I purchased two for my master bath. ... Beautiful vanities. I purchased two for my master bath. They are beautiful and the white quart top is sensational. Rated 5 out of 5 by Dennis from After receiving the first one broken, the 2nd one was... After receiving the first one broken, the 2nd one was delivered without a problem. This is a very nice vanity that looks like a custom made unit. I have another matching unit in a half bath and I am happy with both of these units. Rated 5 out of 5 by Julie from Super pretty.......but it is a very creamy white and nothing matches it. The company Simpli Home ... Super pretty.......but it is a very creamy white and nothing matches it. The company Simpli Home doesn't offer anything to match....mirror, storage cabinets, etc. I still love it though! !